[ABOVE] A portrait of Edwin Thomas Gasson (1827-1904), naturalist, taxidermist and photographic artist of Rye. Edwin Thomas Gasson was born on 13th November 1827 at Pennan, a small village in Banffshire, Scotland and baptised seven weeks later on 3rd January 1828 at Aberdour, Aberdeenshire. However, Edwin Thomas Gasson was not really Scottish. Both of Edwin's parents were natives of Sussex and Edwin was to spend over sixty years of his life in the Sussex town of Rye. Edmund Gasson, Edwin's father, was born in Rye around 1789 and Edwin's mother, Mary Woodham (born c1790) was a native of Winchelsea, a small seaside town, 2 miles south-west of Rye. There is evidence that Edmund Gasson served in the army and it is possible that his military duties brought him to Scotland in the 1820s. It appears that as a young man Edmund Gasson worked as a general labourer in Rye. ( On 7th October 1807, eighteen year old Edmund Gasson, described as a "labourer" in the court records, was charged with assaulting Nathaniel Procter). When he was in his early twenties Edmund Gasson entered into a relationship with a young woman named Mary Woodham. The couple married in Mary's home town of Winchelsea on 6th April 1814. Mary gave birth to a baby daughter named Sarah Emily Gasson in New Romney, Kent, in 1818. (Sarah Emily Gasson was baptised in New Romney on 19th April 1818). 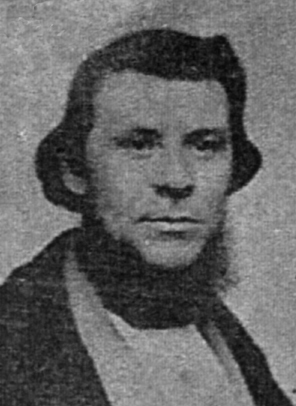 A second child, John Gasson, was born around 1820. By around 1820, Edmund Gasson had left Rye and was heading towards Scotland, accompanied by his thirty year old wife Mary. By the beginning of 1822, Edmund and Mary Gasson had reached the west coast of Scotland. The couple's third child, Mary Elizabeth Woodham Gasson was born in the village of Borgue, five miles south-west of Kirkcudbright, on 3rd February 1822. Two of Edmund Gasson's children died during their stay in the Scottish village of Borgue. John Gasson died on 10th May 1822, aged 2, and a one year old daughter (identified as Elizabeth Gasson on the gravestone in Senwick churchyard) died on 10th January 1823. Another daughter, Louisa Ann Gasson was born in Scotland on 26th November 1823, when Edmund Gasson and his family were travelling north towards the Banffshire coast. Louisa was baptised a month later on 27th December 1823 when the Gasson family had reached the small village of Gamrie, a few miles south of Gamrie Bay. Edmund and Mary must have stayed in the area for about six years, as Edwin Gasson, their eldest son, was born in the coastal village of Pennan in 1827 and yet another daughter, Esta (Esther) Maria Gasson was delivered in Aberdour, only three miles away, on 19th October 1829. 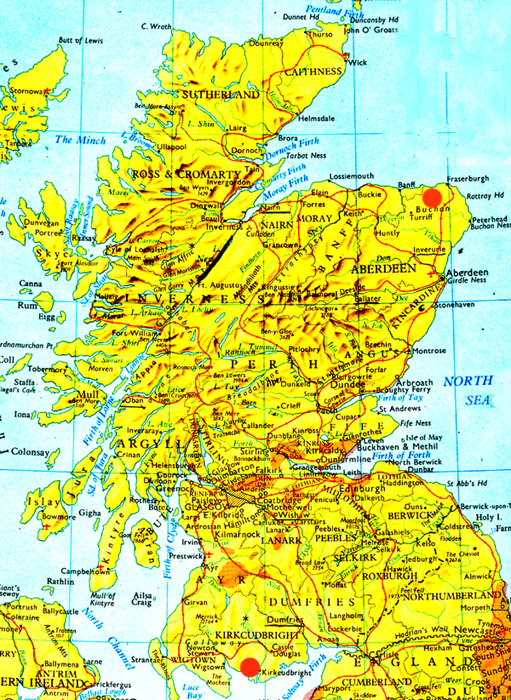 [ABOVE] A map of Scotland showing the two areas visited by Edwin Gasson's parents between 1822 and 1829. Edwin Thomas Gasson was born on 13th November 1827 at Pennan, a small coastal village on the north-east coast of Scotland, between Banff and Fraserburgh. Edmund Gasson and Mary Woodham, Edwin's parents, were natives of Sussex. It appears that Edmund Gasson served in the British Army, which might explain why the Gasson family were travelling around Scotland during the 1820s. At least four of Edwin and Mary Gasson's children were born in Scotland. The red dot at the bottom of the map shows the position of Borgue, the village near Kirkcudbright in the Dumfries & Galloway Region, where Edwin Gasson's sister Mary Elizabeth Gasson was born on 3rd February 1822. By December 1823, Edmund and Mary Gasson had reached Gamrie in Banffshire, where Louisa Ann Gasson was baptised. The red dot in the north-east corner of the map marks the location of Aberdour, Aberdeenshire, where Esther Maria Gasson, Edwin Gasson's younger sister, was born in 1829. On the coast above this red dot, halfway between Banff and Fraserburgh, is the coastal village of Pennan, where the Rye photographer Edwin Thomas Gasson was born on 13th November 1827. Although Edwin Gasson and three of his sisters were born in Scotland, both of their parents were natives of Sussex and by 1841 the Gasson family had returned to Edmund Gasson's home town of Rye in Sussex. The 1841 census records Edmund and Mary Gasson and four of their children at a house in Spring Crescent, Rye. [ABOVE] A carte-de-visite portrait Edmund Gasson (c1789-1873), photographed by his son Edwin Thomas Gasson, photographic artist of 21 King Street, Rye (c1862). In the 1851 census of Rye, Edmund Gasson is described as a sixty-year old "Chelsea Pensioner", which suggests he was a soldier in the British Army when he was a younger man. [ABOVE] A portrait of John James Gasson (born 1841, Rye, Sussex), photographed by his uncle Edwin Thomas Gasson, photographic artist of 21 King Street, Rye (c1860). 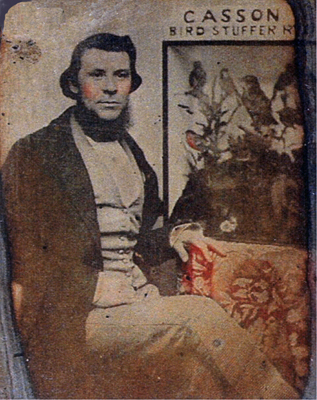 John James Gasson (the illegitimate son of (Sarah) Emily Gasson, the photographer's elder sister) followed in his uncle's footsteps and became a professional photographer. John Gasson worked as a photographer in Hastings, Winchester and Rawtenstall in Lancashire. 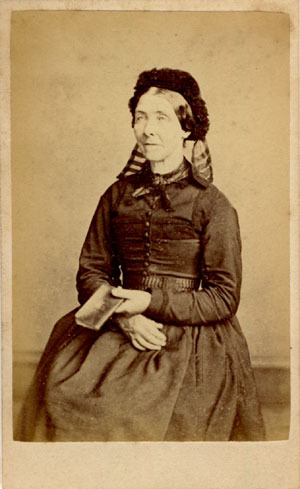 [ABOVE] A carte-de-visite portrait Mrs Caroline Gasson (1824-1867), photographed by her husband Edwin Thomas Gasson, photographic artist of 21 King Street, Rye (c1865). Caroline Cobb married Edwin Thomas Gasson in Rye in 1850. 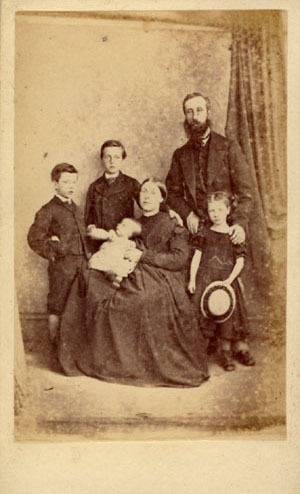 The child on Mrs Gasson's lap is probably her baby daughter Caroline, who was born in Rye in 1864. Edwin's wife died in 1867 at the age of 43, shortly after giving birth to her third child. 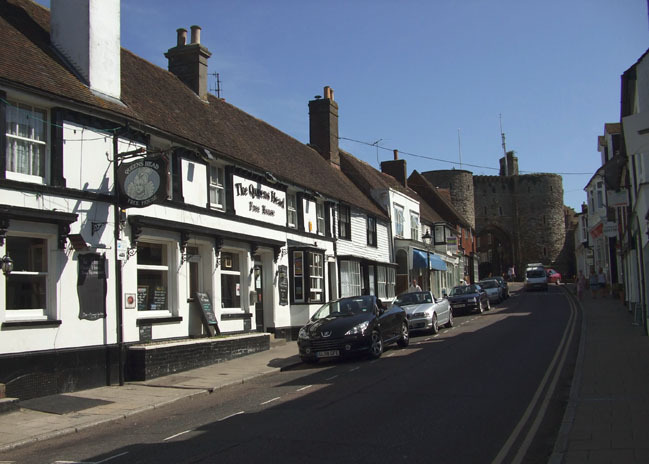 By the time the 1841 census was taken, Edmund Gasson and his family were back in Rye. The 1841 census return records Edmund and Mary Gasson at a house in Spring Crescent, Rye. In the same household are four of Edmund Gasson's surviving children, listed together with their approximate ages - Emily (20), Louisa (15), Edwin (10) and Maria (8) - plus grandson John (aged 5 months). The latest addition to the family was John James Gasson, the baby son of (Sarah) Emily Gasson, Edwin Gasson's elder sister. John James Gasson was born in January 1841 and baptised in Rye on 8th May 1841. Emily had a second child out of wedlock, a daughter named Mary Ann Elizabeth Gasson, who was baptised on 23rd June 1843. Sarah Emily Gasson (who was known to family and friends as "Emily Gasson") married local mariner John Chappell Pulford (born 1818, Rye) during the 2nd Quarter of 1846. Edwin Thomas Gasson started his working career in Rye as a carpenter. Towards the end of 1850, Edwin Gasson married Caroline Cobb (born 1824, Lydd, Kent), the daughter of Henry and Caroline Cobb. [The marriage of Edwin Thomas Gasson and Caroline Cobb was registered in Rye during the 4th Quarter of 1850]. When the census was taken on 30th March 1851, Edwin and Caroline Gasson were living in Landgate, Rye. Edwin Gasson is entered on the census return as a twenty-three year old carpenter and his wife Caroline is recorded as a "Dress Maker", aged 26. Living next door to Edwin and Caroline Gasson, was Edwin's sister Mrs (Sarah) Emily Pulford, now married to John C. Pulford. Emily's two illegitimate children, John Gasson, aged 9, and Mary Ann Gasson, aged 7, lived with them and were being raised by John Pulford as if they were his own children. In the next house was another sister of Edwin's, Mrs Louisa Ann Illenden (born 1823,Scotland). Louisa Ann Gasson had married master mariner Joseph Illenden (born c1825, Rye) earlier that year. The next house in Landgate was occupied by Edwin's parents, Edmund and Mary Gasson. Edmund Gasson, now 62 years of age, was living on a pension. The enumerator describes Edmund Gasson as "Superannuated" and has indicated on the census return that he is a "Chelsea Pensioner". Edmund's status as a Chelsea Pensioner suggests that he might have been based in Scotland during a period of military service. Esther Maria Gasson, Edwin's youngest sister, had married Richard Sharvell Lancaster (born c1822, East Guldeford, Sussex) in 1848. Richard S. Lancaster is listed as the proprietor of a "Fancy Repository" at 109 High Street, Rye in 1867 and by 1881 he was serving as the town's Registrar of Births & Deaths. [ABOVE] A newspaper advertisement for Edwin Gasson, Picture Frame Maker and Naturalist (taxidermist) of Landgate, Rye. (Hastings & St Leonards Times & Rye Chronicle, 2nd January 1858). In Kelly's Post Office Directory of Sussex published in 1855, Edwin Gasson is still listed as a carpenter based at Landgate, Rye. By 1858, Edwin Gasson had established himself as a taxidermist in Rye. The 1858 edition of Kelly's Post Office Directory of Sussex shows Edwin Gasson as a "Naturalist" (taxidermist) in Tower Street, Rye. In an advertisement published in the Hastings & St Leonards Times on 2nd January 1858, Edwin Gasson announced that birds and animals were "Stuffed and Cased to order" at his business premises in Landgate, Rye. The same notice in the Hastings & St Leonards Times advertised Gasson's picture framing business, calling attention to his "large assortment of Gilt and Maple Mouldings" and "Picture Frames made to order." During 1857, Edwin Thomas Gasson was earning a living as a picture frame maker and as a "naturalist" or taxidermist. However, by the beginning of 1858, Edwin Gasson was supplementing his income by taking photographic likenesses. 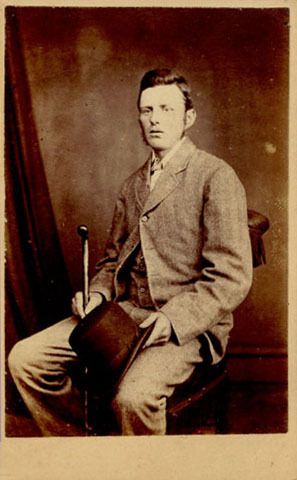 John Pulford ( the great, great grandson of Edwin Gasson's brother-in-law, John Chappell Pulford ) has discovered evidence that shows that Edwin Gasson was taking photographic portraits at his business premises in Landgate, Rye, in January 1858. This would suggest that Edwin Thomas Gasson was Rye's first resident photographer. [In September 1858, the Hastings based artist Charles Goddard (born 1824, Rye) was making weekly visits to Rye with his camera, taking photographic portraits in a temporary studio in High Street, Rye. [See the panel headed Charles Goddard at the foot of this webpage]. [ABOVE] The trade plate of Edwin Thomas Gasson, Naturalist and Photographic Artist of 21 King Street, Rye, Sussex. [ABOVE] A tinted photograph of naturalist and photographer Edwin Thomas Gasson (1827-1904) pictured with a selection of stuffed birds in a case, above which is a sign for "GASSON, BIRD STUFFER, RYE" (1858). Edwin Thomas Gasson became a professional taxidermist ("naturalist") sometime around 1857. In an advertisement published in a local newspaper in January 1858, Edwin Gasson announced that birds and animals were "Stuffed and Cased to order" at his workshop in Landgate, Rye. 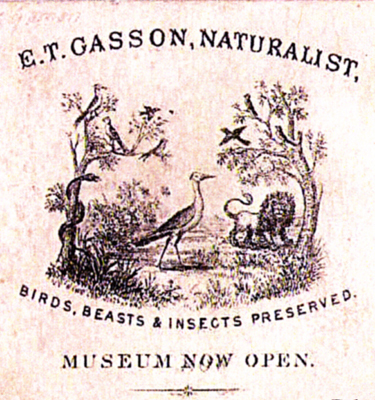 PHOTO: Courtesy of John Pulford [ABOVE] A detail from the reverse of a carte-de-visite by the photographic artist Edwin Thomas Gasson showing an advertisement for "E. T. GASSON, NATURALIST"(c1865). In the mid 1860s, Edwin Thomas Gasson's trade plates generally describe him as a "Naturalist & Photographic Artist" of 21 King Street, Rye, Sussex. Although Edwin Gasson referred to himself as a "Naturalist", on the 1881 census return, he is more prosaically described as a "Bird Stuffer". This particular carte probably dates from around 1865, as the publicity declares that Gasson's Museum was "NOW OPEN". Edwin Thomas Gasson took up the art of taxidermy sometime before 1857. Kelly's Post Office Directory of Sussex, published in 1858, lists Edwin Thomas Gasson as a "Naturalist" (taxidermist) in Tower Street, Rye. An advertisement published in the Rye Chronicle in January 1858, informed the public that birds and animals could be "Stuffed and Cased to order" at Edwin Gasson's business premises in Landgate, Rye. As early as 1865, Edwin Thomas Gasson had established a museum at his premises in King Street, Rye where, for a small admission charge, visitors could view his stuffed birds and animals in display cases. Local trade directories published in the mid 1860s records E. T. Gasson as the proprietor of a Museum in King Street, Rye. 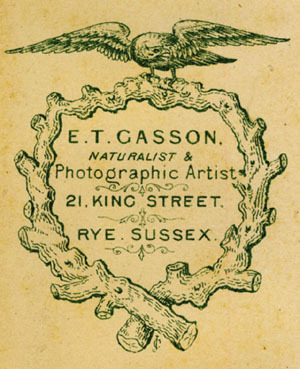 Between 1865 and 1878, Edwin Thomas Gasson billed himself as a "Naturalist and Photographic Artist" at 21 King Street, Rye. The 1881 census records Edwin T. Gasson as a fifty-three year old "Bird Stuffer & Photographer" residing at a house in High Street, Rye. On the 1901 census return, seventy-four year old Edwin Thomas Gasson still describes himself as a "Naturalist" and Edward Verrall Lucas, passing through Rye in the early 1900s noted that "Mr. Gasson, the artificer" charged visitors a penny to view the "stuffed birds and other curiosities" on display at his home. [ABOVE] The Bird Stuffer by William Rainey (1852-1936), an engraving published in The Illustrated London News in 1884. Edwin Thomas Gasson was still working as a naturalist and bird stuffer in his seventies. [ABOVE] A hand-tinted 'collodion positive' portrait of naturalist and photographer Edwin Thomas Gasson (1827-1904). This photographic image on glass (known as an ambrotype in America) was presented in an ornate, moulded frame. The packing at the back of the framed photograph included a newspaper dated 1858. [ABOVE] An advertisement for Edwin Thomas Gasson, Photographic Artist and Naturalist of King Street, Rye, which appeared in the Rye Telegram newspaper on 25th November 1865. This advertisement indicates that in addition to carte-de-visite portraits, Edwin Gasson also produced views of Rye in the form of card -mounted albumen prints and stereoscopic slides. PHOTO: Courtesy of John Pulford Edwin Thomas Gasson probably started taking photographic likenesses in Rye towards the end of 1857. 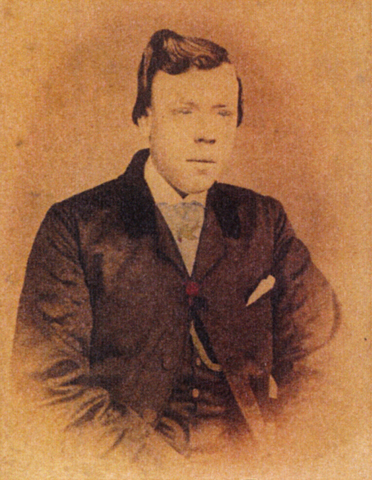 John Pulford ( the great, great grandson of Edwin Gasson's brother-in-law, John Chappell Pulford ) has discovered evidence to show that Edwin Thomas Gasson was definitely taking photographic portraits at his business premises in Landgate, Rye at the beginning of 1858. 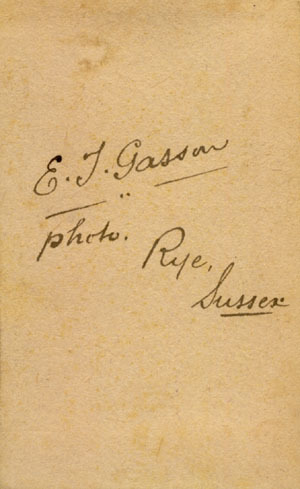 This would suggest that Edwin Thomas Gasson was Rye's first resident photographer. Begs to call attention to his large assortment of Gilt and Maple Mouldings. Picture Frames made to order. Birds and Animals stuffed and Cased to order, on reasonable terms. Photographs taken and coloured from one shilling. This is possibly the earliest references to Edwin Gasson's new career as a professional photographer in Rye. 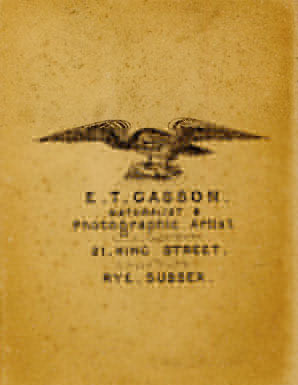 Edwin Thomas Gasson was active as a photographer in Rye for over twenty years. 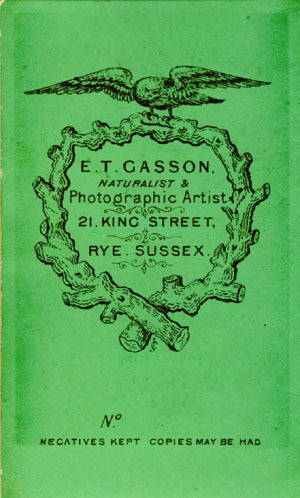 Sussex directories published in the late 1850s, generally list Edwin Gasson as a picture frame maker and "naturalist" (taxidermist) based at Landgate, Rye. 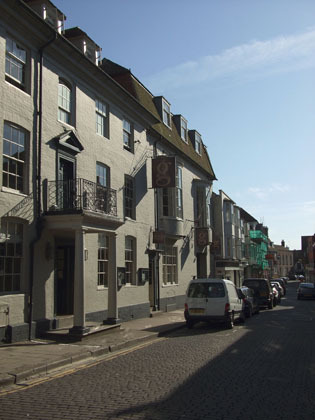 In the 1860s, Edwin Gasson's full business address is given as 21 King Street, Rye. Kelly's Post Office Directory of Sussex of 1866 records Edwin Thomas Gasson as "a naturalist, photographer, stationer, picture frame maker & music seller" in King Street, Rye. 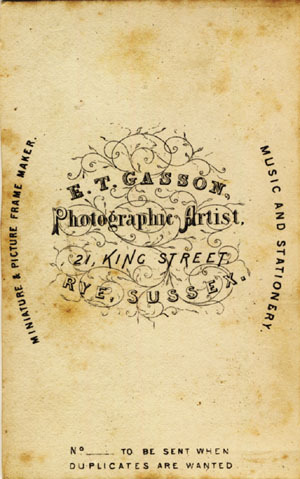 Edwin Thomas Gasson was still listed as a "photographer, picture frame maker & music seller" at King Street, Rye in the 1878 edition of Kelly's Post Office Directory of Sussex. 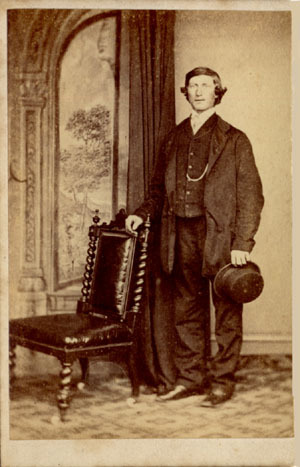 For the first few years of his photographic career, Edwin Thomas Gasson produced "collodion positive" (ambrotype) portraits on glass, but from around 1862, he concentrated on the production of carte-de-visite portraits, small albumen photographic prints mounted on cards, measuring roughly 21/2 inches by 41/4 inches (6.3 cm by 10.5 cm). 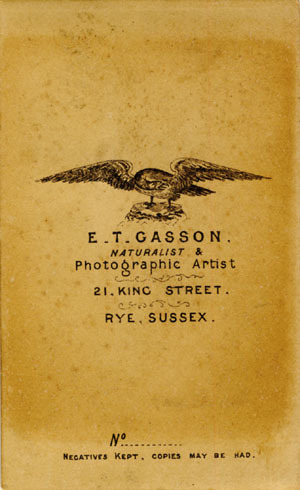 An advertisement for E. T. Gasson, Photographic Artist and Naturalist of 21 King Street, Rye, which appeared in the Rye Telegram newspaper on 25th November 1865 gives details of Edwin Gasson's prices. The advertisement states that "First-class cartes de visite" taken at Gasson's King Street studio cost 6 shillings per dozen. A half-dozen cartes could be had for 4 shillings. Unusually for the time, Edwin Gasson did not add an extra charge for "vignette" portraits. 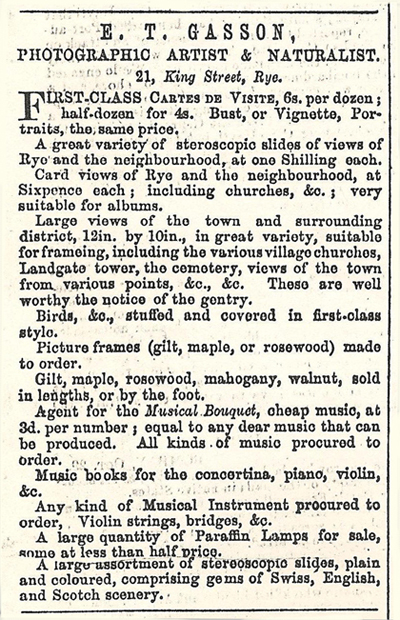 The 1865 advertisement shows that, in addition to carte-de-visite portraits, Edwin Gasson also produced views of Rye in the form cartes, large albumen prints ("suitable for framing"), and stereoscopic slides. At his shop in King Street, Rye, Edwin Gasson also sold "a large assortment of stereoscopic slides, plain and coloured, comprising gems of Swiss, English, and Scotch scenery". An increasing demand for photographic portraits in Rye allowed Edwin Gasson to take on assistants in his photographic studio. It is likely that Edwin Gasson's nephew John James Gasson (born 1841, Rye) assisted his uncle at his King Street premises in the 1860s. At the time of the 1861 census, John James Gasson is described as a "Naturalist" and so he was probably working alongside his uncle, helping him stuff birds and animals at Gasson's workshop in King Street, Rye. Edwin Gasson probably instructed his nephew in the art and science of photography so that he could assist him in his photographic studio, but by 1871, John James Gasson had left Rye and was working as a professional photographer in the Hampshire town of Winchester. Edwin Gasson's nephew was replaced by a young photographer named Albert Edwards (born c1843, Rye). At the time of the 1871 census Albert Edwards, described as a twenty-seven year old photographer on the census return, was lodging with Edwin Gasson and his family in King Street, Rye. When Albert Edwards died in 1873, Edwin Gasson took on an experienced photographer named John Beetham (1831-1877) to assist him in his photographic studio. [ABOVE] The coal warehouse at The Strand, Rye, Sussex, photographed by Edwin Thomas Gasson (1827-1904). In his advertisements, E. T. Gasson offered "card views of Rye and the neighbourhood, at sixpence each". Gasson also offered "large views of the town and surrounding district, 12 in by 10 in, in great variety, suitable for framing". Views included "various village churches, Landgate tower, the cemetery,views of the town from various points, &c., &c.". [ABOVE] A collodion positive (ambrotype) portrait of a man believed to be John Chappell Pulford (1818-1902), photographed by Edwin Thomas Gasson of Landgate, Rye (c1860). 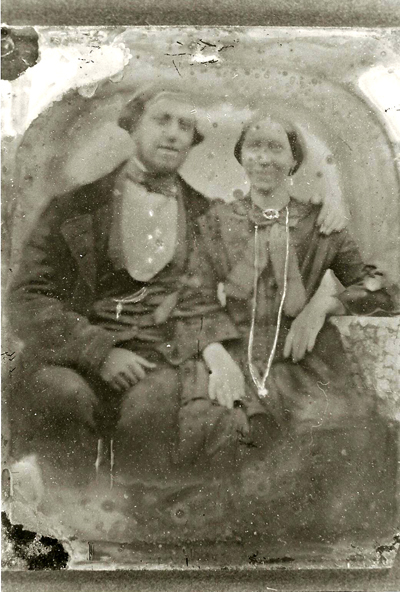 John Pulford, a mariner, married (Sarah) Emily Gasson (1819-1868), the photographer's sister, in 1846. After the death of his first wife, Emily, in 1868, John Pulford married Martha Bachelor (1837-1895). In 1881, John Chappell Pulford was working as a "Stone Merchant". 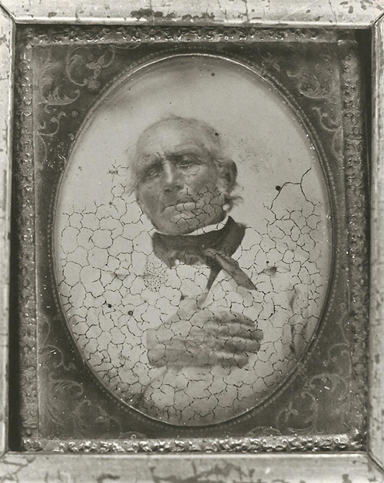 [ABOVE] A framed collodion positive (ambrotype) portrait of an elderly man believed to be Charles Pulford (1783-1858), photographed at the end of his life by Edwin Thomas Gasson of Landgate, Rye (c1858). Charles Pulford, mariner, boat owner and former sailor in Nelson's navy, was the father of John Chappell Pulford [see photo left]. When this photographic likeness was taken, Charles Pulford was running a marine stores business in Landgate, Rye. [ABOVE] A collodion positive (ambrotype) portrait of a married couple believed to be Joseph and Louise Illenden (Ellenden), photographed by Edwin Thomas Gasson of Landgate, Rye (c1858). Joseph Illenden (c1825-1882), a mariner, had married Louise Ann Gasson (1823-1895), the photographer's sister, in 1851. Items of jewellery worn by the sitters have been highlighted in gold leaf. [ABOVE] A collodion positive (ambrotype) portrait in an ornate picture frame produced by Edwin Thomas Gasson of Landgate, Rye (c1858). 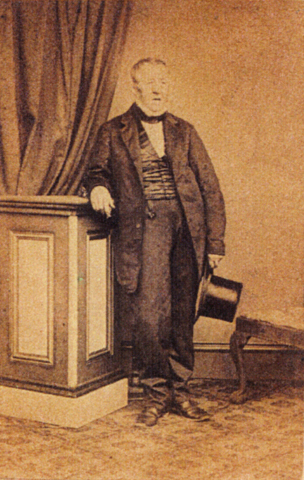 The subject of the portrait is believed to be the photographer's father Edmund Gasson (c1789-1873). Edwin Thomas Gasson made his own picture frames. 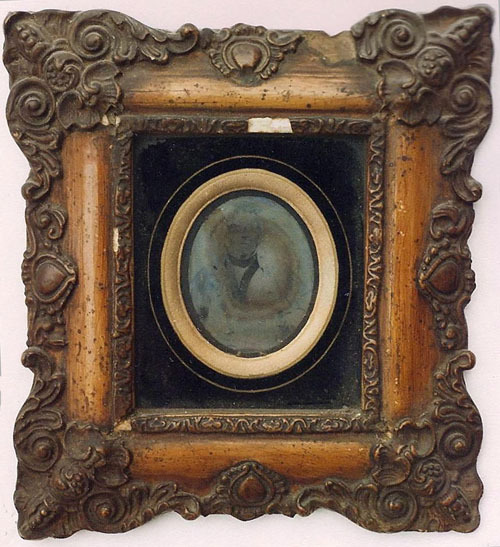 E. T. Gasson's advertisements mention picture frames made from gilt, maple and rosewood. [ABOVE] An 1860s photograph of King Street, the road that led into Rye's Landgate. The stone archway known as The Landgate can be seen in the distance at the end of the street. Edwin Thomas Gasson, who worked as a photographer, naturalist and picture frame maker in the 1860s was based at 21 King Street, the third building on the left in this picture. 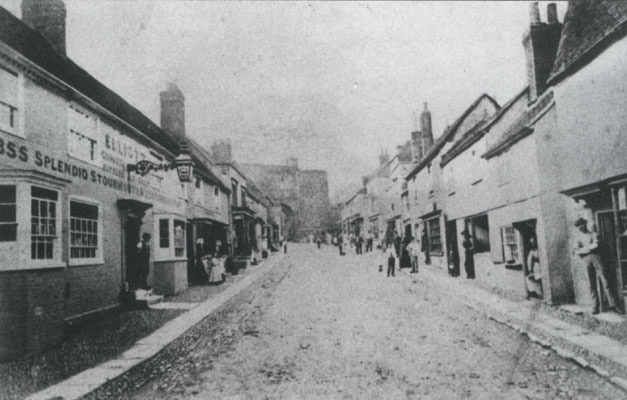 The first building on the left-hand side of this photograph is The Queen's Head public house. 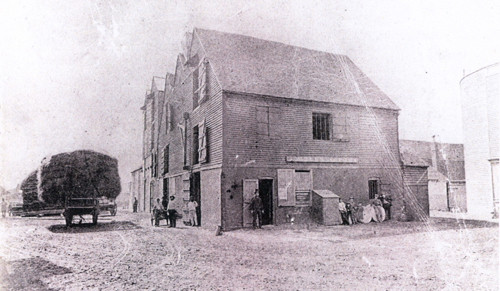 [ABOVE] A modern photograph of Landgate, Rye, formerly known as King Street, where Edwin Thomas Gasson worked as a photographer, naturalist and picture frame maker in the 1860s. The stone archway known as The Landgate, which gives its name to the street, can be seen in the distance at the end of the road. The first building on the left-hand side of this photograph is The Queen's Head public house. Edwin Gasson's workshop and studio was located on the left-hand side of the street in the small shop with the blue awning just beyond the The Queen's Head. 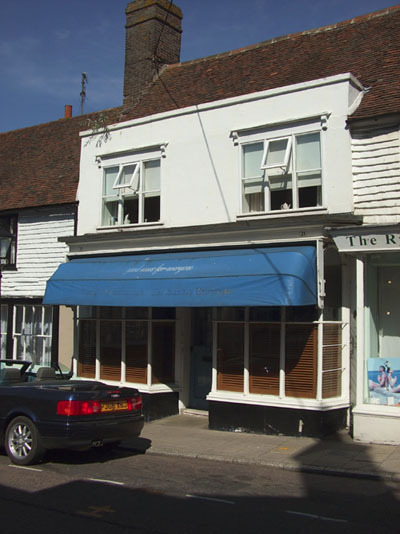 [ABOVE] A close-up view of the shop with the blue awning at 21 Landgate, Rye. The shop at Number 21 Landgate, Rye (formerly No.21 King Street), was where Edwin Thomas Gasson worked as a photographer, naturalist and picture frame maker during the 1860s. [ABOVE] A photograph of Landgate (formerly King Street) looking north towards the Rye Hill railway bridge (c1912). On the right, at the end of the street, is the The Queen's Head public house. A few doors up from the Queen's Head is the business premises of Edward Bryan & Co., Cycle and Motor Car Engineers. The founder of the firm was Edward Bryan (born c1853, Wolverhampton), a cycle maker who established a cycle store in Landgate around 1890. By the time this photograph was taken, Bryan & Co. had opened a garage around the corner in Fishmarket Road. ( A sign above the entrance to Bryan & Co.'s premises reads "GARAGE AT REAR" ). Between the Queen's Head and Bryan & Co.'s cycle repair shop was the building that housed Edwin Thomas Gasson's photographic studio and picture-framing shop. In the 1860s, this building was No. 21 King Street, where Edwin Gasson worked as a photographer, naturalist and picture frame maker. [ABOVE] A modern photograph, taken in 2008, showing Landgate News, a newsagent's shop at No. 21 Landgate, Rye. In the 1860s and 1870s this building in Landgate was 21 King Street, the business premises of Edwin Thomas Gasson, photographer, naturalist and picture frame maker. The marriage of Edwin Thomas Gasson and Caroline Cobb produced three daughters - Elizabeth Gasson (born 1858), Caroline Gasson (born 1864) and Florence Annie Gasson (born 1867). Shortly after the birth of their third daughter during the 4th Quarter of 1867, Caroline Gasson, Edwin's wife, died at the age of 43. After the death of his wife, Edwin Gasson employed a housekeeper named Ann Arkell to look after his three daughters. Ann Arkell, who was born in Kidderminster, Worcestershire, around 1829, was the daughter of Ann and William Arkell ( Anne Arkell had been baptised in Kidderminster on 5th March 1829). 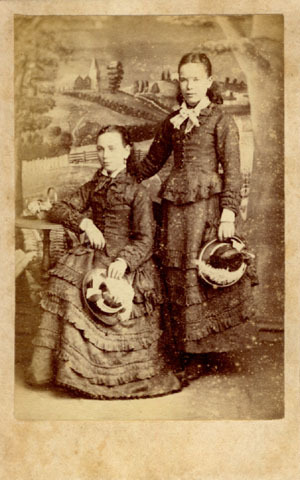 In addition to caring for Edwin's daughters, Annie Arkell was obviously attending to the widowed photographer's needs. 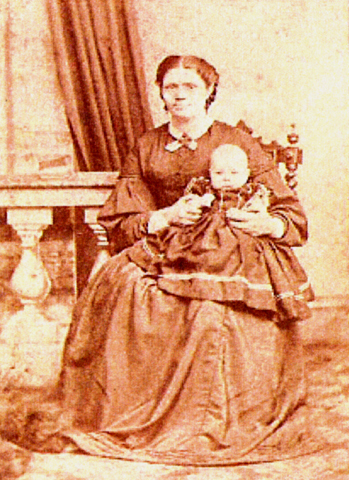 During the 3rd Quarter of 1869, Annie Arkell gave birth to Edwin Gasson's child, a daughter named Jane Gasson Arkell. When the 1871 census was taken, Edwin Gasson, described as a forty-four year old widower, was shown residing at 21 King Street, Rye, with his four daughters and Annie Arkell, described on the census return as his "Housekeeper". Edwin Gasson gives his occupation as "Photographer" on the census return. Lodging with Edwin Gasson in King Street was a twenty-seven year old photographer Albert Edwards (born c1843, Rye), presumably employed as an assistant at Gasson's photographic studio. In 1872, Edwin Gasson fathered another child with Annie Arkell. A son named Edwin Thomas Gasson Arkell was born in Rye during the 3rd Quarter of 1872. The following year, Edwin Gasson agreed to make an "honest woman" of Anne Arkell and the pair were married in Rye during the 2nd Quarter of 1873. Annie Arkell, Edwin Gasson's forty-four year old bride was pregnant at the time of their wedding and she gave birth to a baby daughter named Mary Gasson during the 3rd Quarter of 1873. 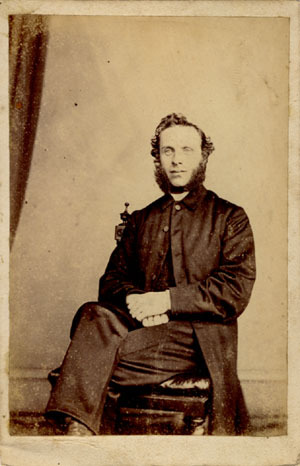 Albert Edwards, the young photographer lodging with Edwin Gasson at the time of the 1871 census, died in Rye during the 1st Quarter of 1873 at the age of thirty. Edwin Gasson then recruited a photographer named John Beetham (born 1831, Preston, Lancashire) to assist him in his photography business. John Beetham, who was a married man with seven children, had run his own photographic portrait studio in Hastings for a few years. In 1877, John Beetham died while trying to save one of his sons from drowning. At the inquest held in July 1877, John Beetham was described by his surviving son as "a likeness taker" working for "Mr Gasson of Landgate, Rye". 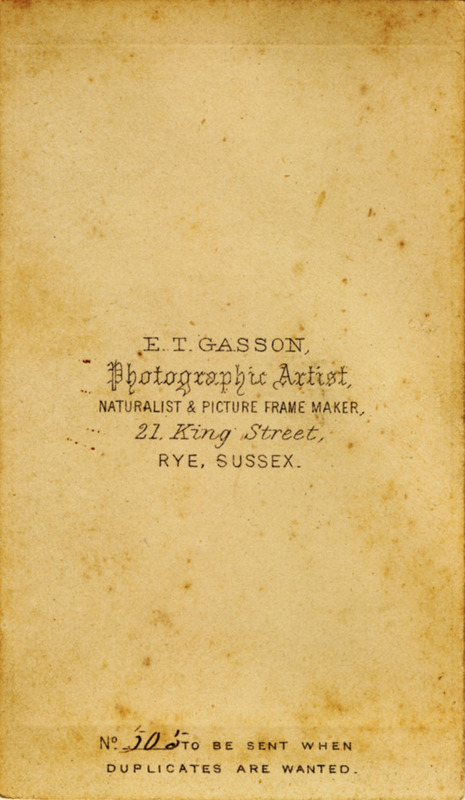 Edwin Thomas Gasson was listed as a photographer at King Street, Rye, in the 1878 edition of Kelly's Post Office Directory of Sussex, but by 1881 he had closed his photographic studio in King Street and moved his family to Rye's High Street. The 1881 census records Edwin T. Gasson as a fifty-three year old "Bird Stuffer & Photographer" residing at a house in High Street, Rye, with his fifty-one year old wife Ann and his four youngest children - thirteen year old Florence Gasson, her two half-sisters Jane, aged 11, and Mary, aged 8 and her half-bother, Edwin Gasson junior. The 1881 census return is the last document I have found which describes Edwin Thomas Gasson as a "Photographer" and I assume after this date he concentrated on his skills as a taxidermist, displaying his stuffed birds and animals in a makeshift museum in Rye's High Street. [ABOVE] The children of Edwin Thomas Gasson resulting from his marriage to Caroline Cobb and his union with Ann Arkell. Jane and Edwin Arkell were born out of wedlock, but took their father's surname after his marriage to their mother Anne Arkell in 1873. 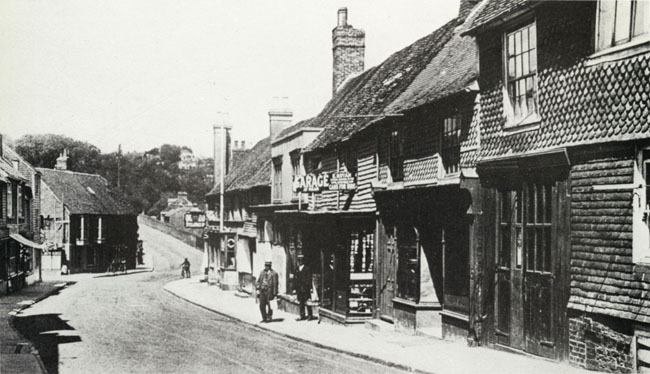 [ABOVE] A view of High Street, Rye, photographed in 1907, a few years after the death of Edwin Thomas Gasson. The 1881 census records Edwin T. Gasson as a fifty-three year old "Bird Stuffer & Photographer" residing in High Street, Rye. [ABOVE] Edwin Gasson's Museum as featured in a Victorian painting of King Street, Rye by the watercolour artist Louise Rayner (1832-1924). Gasson's Museum is the building at the extreme left of the picture. A white sign with the word "MUSEUM" is fixed above the fascia of Gasson's business premises. 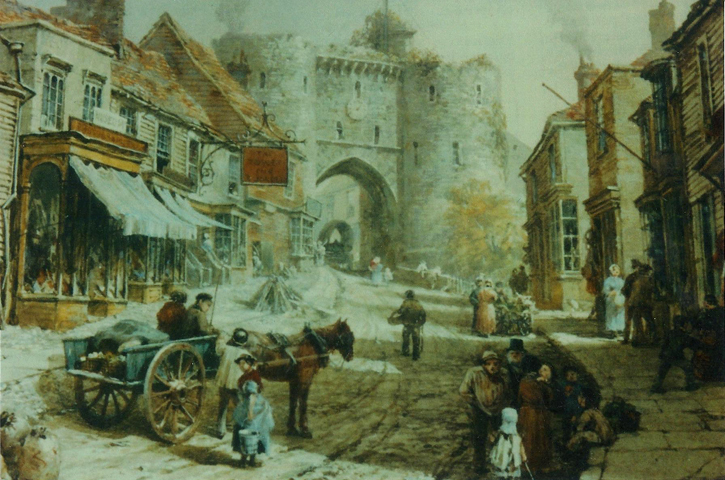 This painting by Louise Rayner, dating from around 1870, was originally entitled "The Old Town Gate, Rye". A few doors to the right of Gasson's shop and museum is the The Tower Inn, marked by an orange coloured sign. The Landgate is in the centre of the picture. Louise Rayner, born "Louisa Ingram Rayner" in Matlock Bath, Derbyshire, in 1832, lived for a time in the Sussex seaside resort of Brighton and regularly visited Hastings and Rye. Louise Rayner, who travelled across the country painting town scenes, died in St Leonards-on-Sea, Sussex, in 1924. 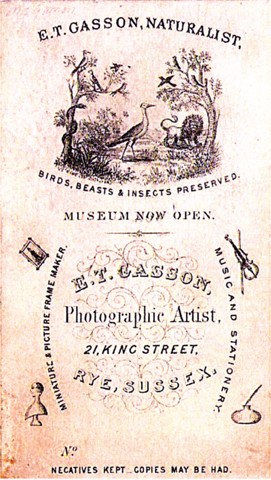 [ABOVE] The reverse of a carte-de-visite by the photographic artist Edwin Thomas Gasson with the caption "E. T. GASSON, NATURALIST - birds, beasts & insects preserved". This particular carte probably dates from around 1865, as the publicity declares that Gasson's Museum in King Street, Rye, was "NOW OPEN". "Among the industries of Rye is the production of an ingenious variety of pottery achieved by affixing to ordinary vessels of earthenware a veneer of broken pieces of china - usually fragments of cups and saucers - in definite patterns that sometimes reach a magnificence almost Persian. For the most part the result is not perhaps beautiful, but it is always gay, and the Rye potter who practises the art deserves encouragement. I saw last summer a piece of similar ware in a cottage on the banks of the Ettrick, but whether it had travelled thither from Rye, or whether Scotch artists work in the same medium, I do not know. Mr. Gasson, the artificer (the dominating name of Gasson is to Rye what that of Seiler is to Zermatt *), charges a penny for the inspection of the four rooms of his house in which his pottery, his stuffed birds and other curiosities are collected. The visit must be epoch-making in any life. Never again will a broken tea-cup be to any of Mr. Gasson's patrons merely a broken tea-cup. Previously it may have been that and nothing more; henceforward it is valuable material which, having completed one stage of existence, is, like the good Buddhist, entering upon another of increased radiance. More, broken china may even become the symbol of Rye." [*"the dominating name of Gasson is to Rye what that of Seiler is to Zermatt" - In 1853, Alexander Seiler (1819-1891) established a hotel in the Swiss holiday resort of Zermatt. The Seiler family's hotel and catering business dominated Zermatt's tourist industry during the second half of the nineteenth century ]. On the 1901 census return, seventy-four year old Edwin Thomas Gasson describes himself as a "Naturalist", which indicates that he was still engaged in taxidermy during the last few years of his life. 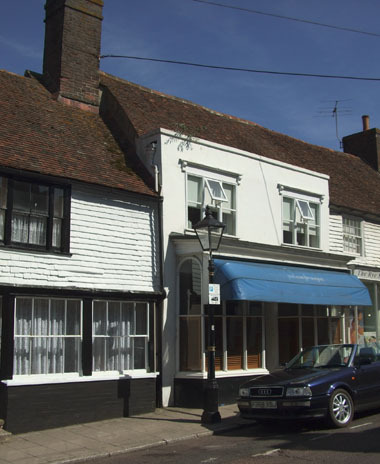 As early as 1865, Edwin Thomas Gasson had established a Museum at his premises in King Street, Rye. Kelly's Post Office Directory of Sussex of 1866 records "Edward (sic) Thomas Gasson" as the proprietor of a Museum in King Street, Rye. When Edward Verrall Lucas (1868-1938) passed through Rye in the early 1900s, he made a visit to Edwin Gasson's museum, presumably then located at his house in Rye's High Street. 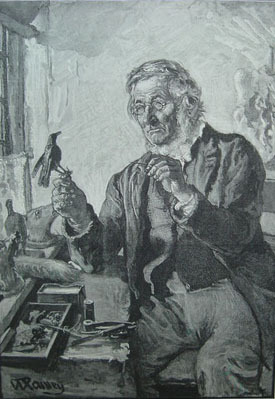 Edward Verrall Lucas in his book "Highways And Byways In Sussex" (1904), notes that "Mr. Gasson, the artificer charges a penny for the inspection of the four rooms of his house in which his pottery, his stuffed birds and other curiosities are collected". In his final years, Edwin Thomas Gasson senior passed his time preparing, stuffing and mounting animals and birds for display in his little museum. Edwin Thomas Gasson died in Rye during the 3rd Quarter of 1904 at the age of 77. Edwin Thomas Gasson's son, Edwin Thomas Gasson junior (born 1872, Rye) had followed his grandfather's example and joined the British Army. At the time of the 1901 census, twenty-eight year old Edwin Gasson junior was serving as a Sergeant in the 7th Dragoon Guards stationed in Hastings. Ten years later, thirty-eight year old Edwin Thomas Gasson junior was residing in Aston, near Birmingham, with his wife Agnes and their two children, Agnes Louise, aged 14, and Mercy Linda Gasson, aged 8. I am grateful for the contributions made by John Pulford, the great, great grandson of Edwin Gasson's brother-in-law, John Chappell Pulford (1818-1902). John Pulford has kindly provided several of the images which illustrate this webpage and has generously shared the information he has gathered on Edwin Thomas Gasson. Some of the material included in my account of the life and career of Edwin Thomas Gasson has been taken from John Pulford's article "Edwin Thomas Gasson of Rye, 1827-1904 - Carpenter, photographer, taxidermist and museum proprietor", which was originally published in the magazine 'Rye's Own' in May 2007. 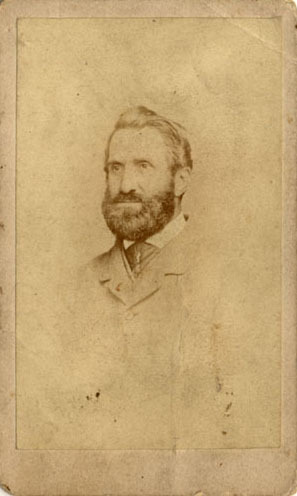 Charles Goddard was born in Rye, Sussex, on 18th February 1824, the son of Catherine and Felix Goddard. Charles Goddard was christened seven weeks later at the Wesleyan Chapel in Rye on 4th April 1824. Charles Goddard was the fourth of eight children born to Catherine and Felix Goddard of Westenhanger, near Stanford in Kent. Felix Goddard (born c1789, Stanford, Kent) married Catherine Russell (born c1792) in Hythe, Kent on 25th November 1816. The marriage license describes Felix Goddard as a "Gentleman", but subsequent census returns give his occupation as "Clerk", with the 1861 census recording his final occupation as "Clerk- Merchant". The union of Felix Goddard and Catherine Russell produced at least eight children - John Fagg Goddard (born 1818), Alfred Goddard (born 1819), Catherine Goddard (born 1822), Charles Goddard (born 1824), George Goddard (born 1826), Ellen Goddard (born 1828), William Goddard (born 1831) and Edward Goddard (born 1834). Charles Goddard showed a talent for drawing from a young age and in the 1840s he tried to further his artistic career by moving to London. On 14th November 1843, at the Holy Trinity Church in Clapham, Charles Goddard married a young widow called Mrs Lucy Ruffin. Born in the village of Buckland, near Dover, in Kent, in 1814, Lucy was the daughter of Sarah and John Hart. On 10th May 1835, at the age of twenty-one, Lucy Hart had married William Henry Ruffin, a painter and glazier from Dover. William Ruffin apparently died within a few years of his marriage to Lucy Hart. At the time of her marriage to Charles Goddard, Lucy was twenty-nine years of age, a decade older than her 19 year old husband. During his stay in South London, Charles Goddard fathered three children - Helen Goddard, who was born in South London on 4th April 1844, Felix Charles Goddard, who was born in Lambeth on 14th March 1846 and Alfred Fagg Goddard, whose birth was registered in the district of Lambeth during the 3rd Quarter of 1848. By the time the 1851 census was taken, Charles Goddard and his family were living in the High Street of Hastings. Charles Goddard's brothers, led by Alfred Goddard (born 1819) had formed a firm of ornamental painters, carvers & gilders in Rye and Hastings. Charles Goddard was still pursuing an artistic career and in 1853 he exhibited two watercolours of domestic subjects at the Suffolk Street Gallery in London. It was while residing at 90 High Street, Hastings in 1853 that Charles Goddard submitted a painting entitled "The Parting" to an art exhibition at the Liverpool Academy. By the late 1850s, Charles Goddard was earning a living as an artist and teacher of drawing in Hastings. 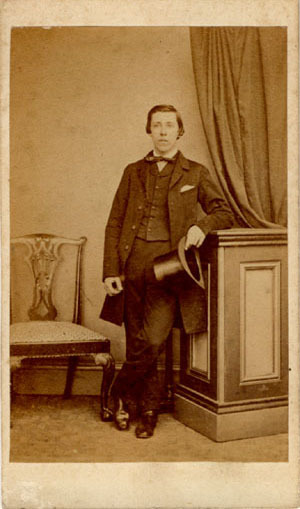 Around 1858, Charles Goddard supplemented his income as an artist by taking photographic portraits in Hastings and Rye. In 1858, Charles Goddard was making weekly visits to Rye with his camera, taking photographic portraits in a temporary studio located "Opposite the London & County Bank" in High Street, Rye. A directory of Hastings published in 1859 records Charles Goddard as a "photographic artist" at 2 Russell Street, Hastings. Charles shared the business premises at 2 Russell Street with his young brother George Goddard (born 1826), who was working as a carver & gilder. By July 1859, Charles Goddard was working as an "Artist & Photographer" at Priory Conservatory, Robertson Street, Hastings. [ABOVE] Charles Goddard listed as a "photographic artist" at 2 Russell Street, Hastings, in Kelly's Post Office Sussex Directory, published in 1859. By the time the 1861 census was taken, Charles Goddard was residing at Portland College, Portland Place, Hastings, with his wife Lucy and his three sons, (Felix) Charles, aged 15, Alfred, aged 12, and John William, a six months old baby. [The birth of John William Goddard was registered in the district of Hastings during the 4th Quarter of 1860]. On the census return, Charles Goddard is described as an "Artist - Teacher of Drawing", aged 37. In a street directory of Hastings published in 1878, Charles Goddard is listed as an artist residing at 9 St James's Road, Hastings. Mrs Lucy Goddard, Charles Goddard's wife, died at their home in Hastings in 1879, at the age of 65. When the census was taken on 3rd April 1881, Charles Goddard was entered on the return as a fifty-seven year old widower, earning his living as a "Painter, Artist & Teacher of Drawing". Sharing his house at 9 St James's Road was his youngest son, twenty year old John William Goddard who gives his occupation as "Decorator & Writer". The household was completed by Mrs Caroline Torrance, a forty-one year old widow serving as Goddard's housekeeper, and her four year old child, Kate H. Torrance. 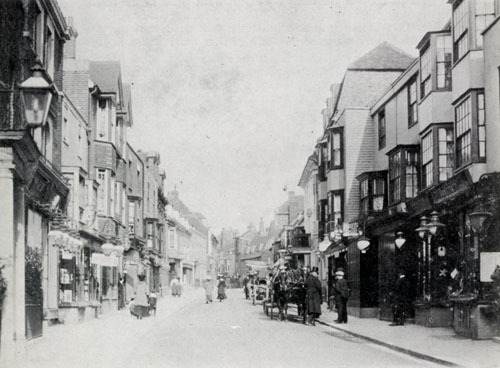 [ABOVE] A photograph of High Street, Rye, taken in 2008, exactly 150 years after Charles Goddard operated as a portrait photographer in premises opposite the London & County Bank in Rye's High Street during the Summer of 1858. [ABOVE] An advertisement for Charles Goddard, "Artist & Photographer" of Priory Conservatory, Robertson Street, Hastings in The Hastings & St Leonards News, dated 14th October 1859. 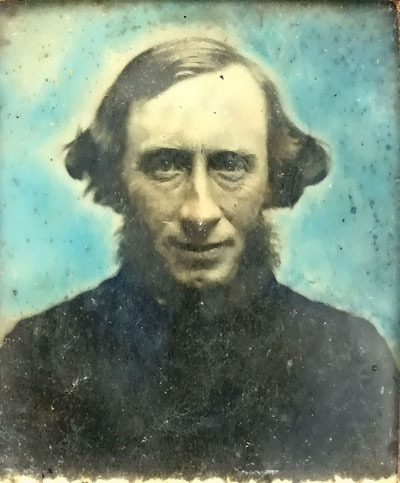 Thanks to Joan Dibble (nee Goddard) who has kindly provided details relating to Felix Goddard (1789-1867), the father of photographer and artist Charles Goddard.